Flats Buggs are miniature versions of our top-selling Curl-Tail Jigs, tied on our bonefish jig heads. They're the most effective and versatile bonefish and light tackle jig in the Buggs arsenal. Every saltwater gamefish that feeds on small baitfish, shrimp, and crabs will readily eat a Flats Bugg. They come in two sizes - 1/16 oz. and 3/16 oz. and can be fished in three different ways. They've already gained a reputation as "trip savers" in certain situations. They're tied with a magnum rabbit strip top and have a palmered zonker strip collar. A few pieces of flash on each side and a single post weed guard round out this simple yet deadly effective jig. Without the grub they're a little over 2" long, and a little over 3" with the grub. Rather than a realistic version of something, Flats Buggs give the profile and impression of all of the small baitfish, shrimp, and crabs that bonefish, permit, redfish, speckled trout, snook, flounder, pompano, and snapper feed on. Flats Buggs land softly and hook point up, making them perfect for sight casting. When resting on the bottom the rabbit and flash makes them look alive, and scooting them along the bottom will kick up a little puff of sand or mud. This makes them look like they're trying to escape, and will almost always trigger a strike! The addition of the grub gives them an enticing fluttering action when you swim them and bump them along the bottom. Click Here to Buy Flats Buggs in the Online Store! Below is the story behind this new jig, including the resistance I had to tipping (not in a restaurant), the realization that big fish sometimes eat tiny bait, and the fun of new color combinations. All relevant links are included at the end. Over the years I've often heard that fishing guides at bonefish lodges will insist that their customers tip their bonefish jigs with shrimp, squid, or some other type of bait. I don't doubt this is effective, but up until now we haven't offered a bonefish jig that was useful for this type of fishing. The reason is that our other models are inspired by the most effective fly patterns and are made to imitate shrimp, baitfish, and crabs. We want them to be just as effective as flies, and they're tied to fish as is. Back in 2010 when I was just getting started, two of my best customers were Thomas and Kaylin Barlow. They bought the original versions of the Curl-Tail Jigs and very quickly realized how effective they were fished without the grub. In fact, they ordered several dozen of the Blue Crab version very early on. They'd fish them as a blue crab imitation, and were very successful. Another aspect of the Curl-Tail Jig that makes it popular is the ability to change out the grub to a GULP product or small piece of bait. The head design makes it land hook point up, and you can just let it sit there, smelling pretty, or slowly drag it along the bottom for redfish, drum, or flounder to find. Then there's the most popular way to fish a Curl-Tail Jig, right out of the package with the 3” grub. Why wouldn't a smaller version work? Determined to find out, I started working on the first prototypes. I discovered that the company I buy my soft plastics from offered their curl tail grubs in a 2” size. I bought several bags and began experimenting with them, tying different versions of a Curl-Tail Jig on my bonefish jig heads. I simplified the pattern a bit and then figured out how to incorporate a Buggs custom screw lock. I was very pleased with how they turned out and posted a picture of the first set on my Facebook and Instagram accounts. The response was very positive, and I began selling a few and surprising some of my customers with the prototypes when they placed their orders online. The reports were very positive, from both shallow water anglers in the tropics and from the same type of fishermen here along the Gulf Coast. One such customer is my friend Lee Melvin in Louisiana. 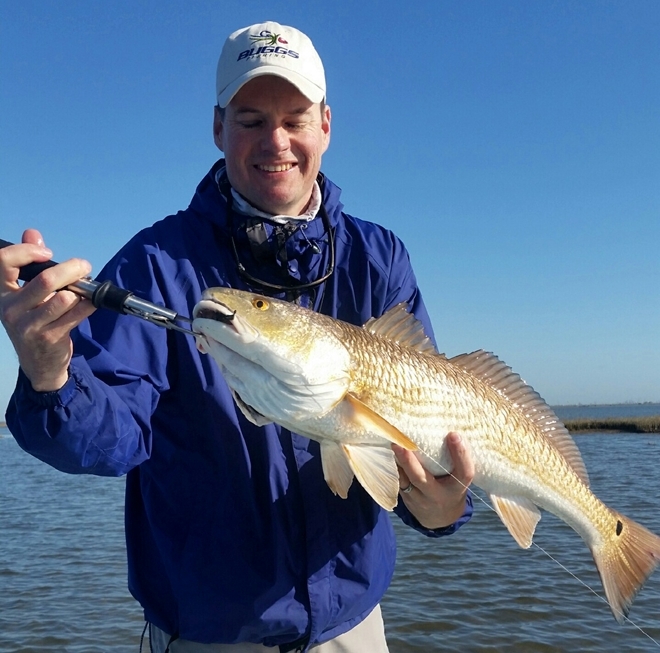 He's a dedicated kayak angler who targets redfish in shallow water. He's been fishing these Flats Buggs for a while and has found a permanent place for them in his tackle box. Here's a very healthy red he caught on the blue crab version. "I've been fishing this lure for about a year, and the Flats Bugg is the best sight fishing lure I've used for thick grass. Because the lure hits the water so quietly, it's great in small openings in grass where redfish get spooky. They're also great in the winter and fall; I use the Flats Bugg over the Curl Tail Jig when smaller bait is present. I've sight fished redfish, black drum, and even sheepshead with them. If I'm fishing for redfish I will always have a Flats Bugg or Curl Tail Jig tied on." Where did the name Flats Buggs come from? Based on the effectiveness of the Curl-Tail Jig and on the feedback I had received from Lee and Mark, this new jig was going to get made. Now I needed a name. Just like the Curl-Tail Jig, this new jig would be super versatile and super effective for fishing the flats. This triggered a memory of those first two lures I offered back in 2010. 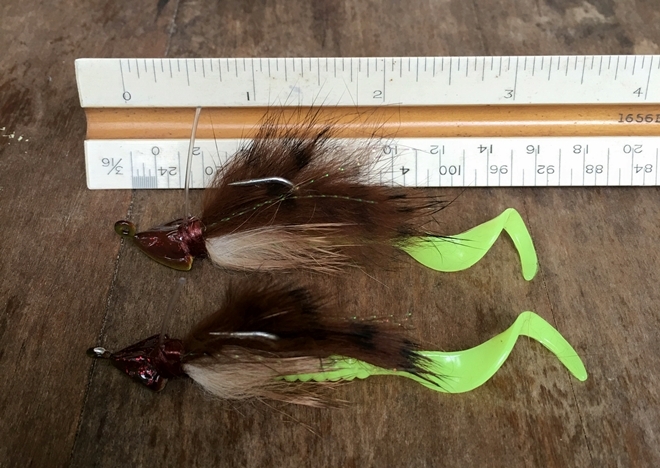 Some might remember that the very first Curl-Tail Jigs were actually called Flats Buggs. What better way to honor that first name than to bring it back on this new creation? And here is that new creation, and the three different ways you can fish it. You can see above and on the left that, just like the Curl-Tail Jig, the Flats Bugg comes rigged with a 2” grub. When you remove the grub, you get a profile that could imitate just about anything. In the middle you see the Blue Crab version with the grub removed. I think it would pass for a little crab. And to tip it with bait or to change out the grub, slip the top piece of rabbit strip off the hook, install your bait or new grub, and slip the top rabbit piece back over the hook. The Black Gold version on the right is what a Flats Bugg looks like with the rabbit pulled back. One of the most enjoyable parts of fishing lure design is choosing the colors. It means that you have the design completed, and now you can imagine all the different colors of the bait you're imitating and the colors you already know are effective. We started thinking about our favorite bonefish jig colors, and knew several we had to include right off the bat. These would make up our Tropical Kit, and you can see what we included below. On the upper middle and right you'll see White Stripe and PBT, dead ringers for little shrimp. The bottom middle is Turtle, and the bottom left is Blue Crab. These take care of common crab colors. The bottom right is the most popular of the bunch, the barred tan color we call Natural. Natural can imitate baitfish, shrimp, and crabs. On the top left is a new color we call Key Lime. This yellow chartreuse is deadly on just about anything, anywhere. Then we got to thinking about our favorite Curl-Tail Jig colors, and we knew we'd have to duplicate them in these new Flats Buggs. Here are the colors included in the Coastal Kit. Along the bottom and top right you have our favorite Curl-Tail colors Blue Crab, Electric Chicken, Black Gold and the dark brown Texas Tea. On the top left you'll see Key Lime, for the same reasons as above. And in the middle is a color I'm really excited about - New Penny. How Do I Fish It? There are lots of possibilities when you're fishing a Flats Bugg. When you're sight casting you can swim it in front of the fish, bump it along the bottom, or just let it sit there and look alive. The same goes when you're blind casting, although I tend to think swimming it along while giving it a little jigging action will do the trick most of the time. When you've tipped it with bait, you'll want to move it slowly or not at all. As with all Buggs, before you make your first cast tie it on and hold it under the water. Squeeze the rabbit strips between your fingers until the air bubbles come out. The hide holds little air pockets, and they need to come out before you fish your Flats Buggs. When the air comes out the hide will absorb water, making your Bugg heavier and easier to cast. It will also come alive in the water! The 3/16 oz size will cast easily on your medium-light action baitcast or spinning rod. The small profile gives it very little wind resistance. It will feel a little different than bigger lures, so it is a good idea to cast it several times before you get into a sight casting situation. The 1/16 oz size is a challenge to cast with anything but a light action spinning rod. But the payoff is great, especially when you find yourself in the most challenging sight casting situations! And it's really fun to tangle with a feisty redfish or bonefish on light tackle. The picture above was taken back in February. Clay Sheward took me fishing back in Greens Lake. We were drifting in about 6" of water. The water was pretty clear but there was some wind and the redfish blended in pretty well with the bottom. Before the sun got up we'd find ourselves right on top of the redfish when we saw them. The 1/16 oz Flats Bugg in Black Gold was the ticket that day. I didn't always make the best cast, but they never spooked. I made the mistake of switching to a 3/16 oz size later in the day, but ended up spooking fish. Sometimes it pays to go small. And yes, I do look like a doofus with my eyes closed. But you're supposed to be looking at the fish! The payoff for me with Buggs comes when I get a call, email, or text from a happy customer. I love to hear about the fish my customers catch, and to see pictures with their smiling faces holding their fish. It happened again with these Flats Buggs in the middle of the two days I worked on this article. A guy named Brent Domingue from Lafayette, LA called me and told me how Flats Buggs had saved his recent trip. He was in a familiar spot, throwing the same lures he normally throws, including Buggs Curl-Tail Jigs. But the redfish he was seeing were having none of it. He said he was fishing in thick grass and there was a lot of little bait. Then he remembered the two Flats Buggs he had picked up at Pack & Paddle at the insistence of Scott Bienvenu. He tied one on and started catching fish. He told me it made the difference between catching 1 or 2 fish without the Flats Buggs and catching 9 or 10 with them! I thanked him for calling me, and told him it never gets old to hear stuff like that. Do me a favor, would you? If you ever find yourself in a shallow saltwater environment and think the fish might be chasing small bait, put a Flats Bugg in front of them and let me know what happens. Something tells me you won't regret it! Any questions? My contact information is below. Buy Flats Buggs in the Online Store. 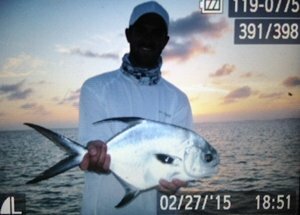 Learn more about Tarpon Caye Lodge where Mark tested the Flats Buggs. Go see Scott and the rest of the good people at Pack & Paddle the next time you're near Lafayette, Louisiana. Such a cool store! In the Houston area? All three Fishing Tackle Unlimited locations carry Flats Buggs. Find the one nearest you! When Clay Sheward completes his guide training his link will appear here. He already has my endorsement!